Unless you've been reading my blog for awhile, you may not know that I am a suppressed potter. Over the past five years, I've tried to figure out ways to make my love of pottery fit into my life. For awhile, I had a healthy little supply of buttons and chunky stoneware pendants that I was putting up in my etsy shop and I loved it. Creating things with clay was so relaxing and inspiring. But sometimes life forces us to set some things aside for others, and for now pottery is on the back burner. But someday, I'm going to rejuvenate that hobby and get back to it. I really am. Meanwhile, through the joys of blogging Melissa and I became good friends and she quickly became my potter-mentor. And I live vicariously through her flickr stream. Last spring I said to her that I desperately needed a little one-serving size colander for washing berries and she went to work creating the perfect thing–and then the berry bowl craze began. Really, I'm not sure how I could manage to live without one. Mine doesn't even make it back into the cupboard, but just sits happily on the windowsill above my kitchen sink. But one of my other favorites of Melissa's creations are her honey pots. Some day I'll tell you my life lessons learned over a broken honey pot, but in the meantime let's just say that Melissa's honey pot is the cutest thing on my kitchen table. Plastic honey bear's are so last year. And lucky for you, Melissa is giving away a honey pot to one of you! The honey pot she's set aside looks a lot like the one I have–a buttery yellow with her signature bee stamped on the side. And it even includes the wooden honey dipper. My children have finally mastered the honey dipper "twirl" to get the honey from the pot to the toast without dripping. Be sure to stop by Melissa's blog or photostream. She is a sweet friend and a talented artist worth getting to know. And if you just can't stand to play the odds, she's got a few honey pots in her shop right now. And the berry bowl craze will begin again in May or June. Leave a comment on this post if you'd like to be entered to win Melissa's honey pot. I will pick a random winner and announce on Monday. That honeypot is just perfect. The debossed bees in the clay are so adorable.The berry bowl pottery colander is BRILLIANT!I wish I had access to a kiln so that I could attempt pottery. I know mine would be clumsy and not gorgeous like Melissa’s, but what a joy it would be to work with. I just read your post about a complex life. It was linked on another blog I follow. That was really beautiful how you were able to share what you were feeling so gracefully. We are getting ready to close on our own little fixer-upper and I’ve been forseeing some of these frustrations myself. I think your words of wisdom will stick in the back of my mind. And I would love to win that honey pot! It’s so cute! This is so beautiful!! Please enter me in the drawing…thanks for the great giveaway. Honey Pot Honey Pot! Yay! My 4 year old is obsessed with honey–honey on toast, honey on plain yogurt, honey in chamomile tea, honey with peanut butter. We would love to have that honeypot on our table, it’s adorable. I love love bees and I love love honeypots! That one is the best! That’s a honey pot Pooh would envy!! That honey pot absolutely sings to me! That honey pot is just beautiful. The color is just perfect. That is definitely something to be proud to display in the kitchen. Melissa, you are very talented. NOt sure what happened to my login but this is me…That honey pot is just beautiful. The color is perfect. That is definitely something to be proud to display in the kitchen. MY Daughter would love this, we just finished reading Winnie-the-pooh, so sweet! I have a berry bowl already and love it and use it almost every day as the berry season starts. I love it! I am totally loving this honey pot too because I actually need one. We’re having a bit of a honey issue around here! I think I initially “met” Melissa through you. I’ve been lucky to really meet her too and count her as one of my friends. I love this bloggy world. Oh my kids would have so much fun mastering that honey pot! It would also look so cute on my table! this is GORGEOUS! i had never thought of having a honey pot! but this one is incredible. Her work is sooo gorgeous! I’d love to own one of her honey pots. I have the perfect place for it! oh, hi! I’m so flattered. Really! I’m blushing like a bride at a shower! I can’t wait to send this to one of you! I looked at her shop and was hoping I could find another one with bees on it and I couldn’t find one. I love bees (hence the name) and will try for ts one. If I don’t win it, I’m going to have to see if I can special order one just like this. Pick me! Pick me! Her work is amazing. I heart this honey pot! molly, would you delete this? I thought my first one didn’t show up b/c I didn’t verify. xo. Hi, there was just one more, but I make them regularly and will have more bee-printed pots in the coming weeks. But maybe you’ll win this one! Sooooooo much prettier than my plastic tub o’honey! This is so pretty, and I’d love to have it for my table! That honypot is adorable. I love honey with peanut butter on wheat bread! Very cute pot…and can’t wait for this year’s berry bowls…great idea! My bee hive just arrived in the mail yesterday, so I must have a honey pot! This one is so beautiful; if I’m not lucky enough to win one, I think I’ll need to buy one. Thank you for sharing Melissa’s lovely work. I am a suppressed potter, too! I am longing for the days I can fit it in again somewhere. Sigh. My children have officially broken almost every utilitarian piece I kept around the house. The time is coming soon, I can feel it! yes, yes, yes. I’d love that. i love it! with the amount of honey i eat it would be nice to have it on the table for easy access! beautiful! I love her pottery so and I’ve been eyeing her honey pots and imagining one on my table. 🙂 I hope I win – he he! I love that honey pot! It would totally match my decor and we put honey in or on most everything. What a “sweet” giveaway! I love her work. It’s one of my favorite etsy shops. I’m eagerly awaiting the berry bowls ths season! How adorable! I love honey pots (not that I have one!) and that one is just perfect! I have fond memories of the honey stick from my parents house. Not, however, of the honey pot–I think it might have been an antique crystal doodad. This honey pot is lovely and I am sure that it could both equally hold up to some honey love and also create a few memories of it’s own for my two girls. Thank you for such a neat giveaway–I lovelovelove Melissa’s work. oooh…sweet idea! and great craftsmanship! Awwww, such a sweet work of art! I must have spring fever because my house suddenly is filling up with bee related items. Our new baby is even nicknamed Bea! Oh, I have actually been thinking of browsing etsy for a honey pot recently, so perfect timing! Oh this is fabulous! We get raw honey from a local company and keep it in a mason jar. I would love to keep it in one of these beautiful pots instead! 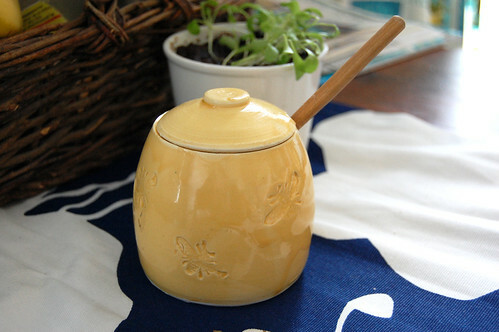 I have several of Melissa’s pieces, but would love this yellow honeypot with the bees on it! It’s gorgeous. How beautiful! Perfect for honey for your tea on a crisp spring morning! I live vicariously through her pots, too. 🙂 Pottery is not something that mixes well with having toddlers around, I find. We’ll all get back to it someday! The honey pot is so cute and we could use one in this house. I almos bought a berry bowl last year, i will definety have to buy one this year. After years of honey from the jar, maybe time for a real pot! oh, i would love this! i remember you mentioning your berry bowl before and checked out her stuff (and LOVED it), and with how much honey we consume around here, a honey pot is definitely in order! I have a blue honey pot and a butter dish by Melissa and they are treasured belongings. She is a truly lovely and talented person. Because of her encouragement, I’m taking a pottery class this spring! Yay! Oh, I love it! We have been searching for years for something to solve the honey-serving problem in our house. This is beautiful! Adore the honey pot! Unfortunately I am VERY YESTERDAY with the plastic bear – hee,hee,hee…Thanks for the give away! Ooh, I just stumbled across her shop a few days ago. Love those bees! so cute! I love pottery too. Thank you for such a great giveaway. That honey pot is so cute. My husband is a beekeeper and he would LOVE that little honey pot! I love it becasue it will look so much better on the table than the ball jar the honey is currently in. Oh, I hope you pick me! Lovely little honey pot! My grandparents have bees…so we ALWAYS have honey around…but still no “perfect” honey pot. They’re hard to find! So pretty! We love honey here! I think a new honey pot would be a fun addition to our breakfast table! I also have a secret passion for pottery. Someday I would love to take a class and learn how, but for now I collect other’s creations. What a pretty honey pot! We go through honey pretty quickly around here. The pot would never be put away! We go through honey like crazy around here so I’ve been looking for a honey pot. That one looks perfect! So lovely, cheerful and perfect for spring! Ohhh…we have quite the affection for honey in our home. What a lovely pot to keep it in! sarah, really???? awesome!! you also are lovely and talented and encouraging. I’m so glad you “friended” me! Oh – it’s adorable! My kids would love this! We are big honey eaters!! Oh, I’d love a honey pot! We are working on our allergies in part by eating more raw local honey! Hope I win! That is absolutely beautiful as is everything else in her shop! I would love one of those! With the arrival of Artisan Bread in 5 Min a Day at our house this past Christmas we have been consuming copious amounts of honey lately! This would be perfect! That honey pot is so cute! I’ve always wanted to do pottery and just haven’t had the chance to get into it yet. Don’t see it happening any time soon either with a 2 1/2 yr old and a 6 month old. I am a busy person right now. Hopefully some day…. I am amazed at how someone can turn a bowl with their hands and fingers. I would love to learn how to do that someday! I love the honey pot. I can see it being a fixture on my kitchen table. Oh so pretty in my favorite colour! I would love a chance to own that honey pot. Thanks. Wow, that’s beautiful. I haven’t had a honey pot since I was little! I definitely did not have the wrist twirl down. Thanks for the giveaway! That is about the cutest thing I’ve seen all day, wait, all week! Hope I win! 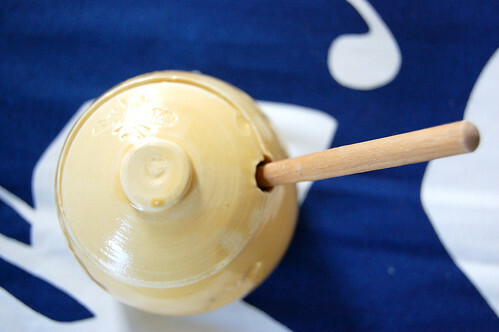 we’d love to put that honey pot to good use – here in a household where honey and yellow are loved! Oh, that is lovely! So much better than a plastic honeybear!!! I have been looking for a good honeypot! I love using honey in my recipes and to my tea. Please enter me in the drawing! Thanks, Melissa’s work is so nice. My honey-loving boys would delight in that– how lovely! Melissa does beautiful work. That honey pot would look soooo good in my kitchen :). Thanks Molly for the chance to win and for sharing yourself so beautifully. Have a Happy Easter! that is so sweet (pun in tended LOL). my daughter puts honey on her porridge every morning and is desperate to be able to get it from a honey pot instead of the plastic bottle! How awesome! Got my fingers crossed. I would love a honey pot! I’ve always thought those drizzling sticks looked like fun. I, too, am a supressed potter so I feel your pain! 🙂 This honey pot is gorgeous. I immediately went to Melissa’s blog and etsy shop and pow…I’m addicted to another blog! ;)Thanks for the great find and I’d love to be entered! I was just looking at our honey bear and thinking it’s so silly. My mom had a honey pot when we were growing up…that’s what I’m missing! Thanks! I love this honey pot!! It is so lovely and sweet. Please include me in the drawing. Oh I love the honey pot!! Gorgeous! Thanks for the give away!! I’d love to be entered! I’ve been looking for one of these for ages! that is so cute! my youngest loves peanut butter and honey sandwiches for lunch and would love to have this on our table! of course i would love that honey pot. who wouldn’t??? and we LOVE honey around here – so it would be well used and enjoyed! Her pottery is phenomenal – I have been eyeing her etsy shop since last summer… Just beautiful! I love this honey pot. I enjoy reading your blog – thank you! What a wonderful honey pot, her work is wonderful! I too have always loved pottery and wished it was something I could do. Maybe someday, when I have more time. We don’t own a honey pot but they are great. I would love a chance to win. Thanks for the contest!